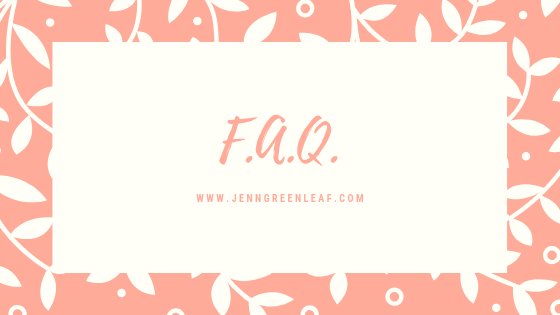 Here, you'll find the most frequently asked questions about Jenn's freelance writing business (or the business of writing, in general). She'll continue updating this section as more questions come in. You mention design on here, are you a photographer? I enjoy amateur photography and, eventually all the logos and branding on here will feature my images. I sell designs on Zazzle, CafePress, and RedBubble. I have a Facebook page I maintain that's an umbrella account for each seller platform, ArtistWriter's Outlet Shop. In the past, you were a bestselling non-fiction author. Are you going to write books again? As you can see from my Amazon author page, Jennifer Greenleaf, each of my books is currently out of print. However, I do have plans to rewrite many of them to bring them up-to-date. I also have plans to write new titles during 2019 and into 2020. Previously, you were a mixed-media artist and teaching artist. Do you have plans for going back to that or sharing content related to that work? I don't have immediate plans to go back to mixed-media art or teaching. However, I do have plans for writing the curriculum I taught while I was a teaching artist through L/A Arts.